If you’re looking for a safe investment during a tumultuous economic climate, then look no further than gold coin. Gold coins have often been said to be among the safest investments in the world, seeing as it is what the value of money is actually based on. While other assets including stocks and shares are very much impacted by even small fluctuations in the markets, gold is a physical, which means it’s far more likely to retain its gold. In fact, gold can even go up in value as other assets fall. And if you’re going to invest in gold, then the best way to do it is through ‘direct ownership’. That means that you 100% own the gold and in fact it means that you can literally pick the gold up and hold it in your hand. You can even store it in your own home in some cases. This is the case when you buy gold coin – here, you’re choosing to invest in something tangible and physical and there is no confusion or dispute about ownership. Gold coin is just such an example of direct ownership gold. This is a type of gold you can invest in that is affordable, convenient and also actually very rewarding. Coins hold their own value but can in some cases be works of art, or even collectors’ items! 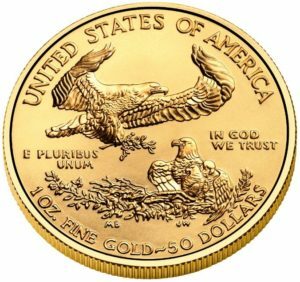 In this post, we’ll be looking at one particular type of gold coin: the American eagle 1-ounce gold coin. The American eagle 1-Ounce Gold Coin is one of the most popular gold bullion coins in the US. The series was first introduced in the US in 1986, at which time it came in four different sizes: 1oz, ½ oz, ¼ oz and 1/10 oz). During the initial runs between 1986 and leading up to 1991, the US mint used Roman Numerals to date the coins. Since 1992 however, traditional Arabic Numerals have been used. On the front of the coin is an image of Lady Liberty that is the same as that found on the famous $20 gold piece (which was printed from 1907-1933) and designed by Augustus Saint-Gaudens. She is standing with her arms apart, walking forward and with lines radiating out from behind her. On the back are the eagles that give the coin its name. One Eagle is in flight with its wings curling round in front of it, while another sits in the bottom right corner. Together, they have a majestic and dynamic appearance. Emblazoned across the top are the words ‘United State of America’ and further down ‘In God We Trust’. There is some foliage and branch in the image as well. The US Mint is producing quantities of the American eagle 1 oz in mint condition in order to help maintain its status as a leader in the gold bullion market. The tender value is symbolic, seeing as the American eagle 1oz actually fluctuates a lot depending on the value of gold. In other words, there is no single value that you can give to the coin. The coin contains exactly one ounce of gold and is alloyed with only a small amount of copper which helps to give it durability. Between January and May in 2015 alone, the US Mint produced 122,500 of these coins. That’s a lot of coins and the reason for this is just how popular the coin is. This coin has a worldwide appeal even outside of the US and this is good news for investors as it means more places to sell the coin! The American eagle 1-ounce gold coin outsells other bullion gold coins partly because of its affordability. It’s also a particularly popular choice in retirement accounts. The American eagle 1-ounce gold coin is easy to buy and sell and because it is so well known, you can find lots of places to purchase it as well as to find information on it. The coins are also a good size and lend themselves to easy transportation and storage. That’s in part thanks to a plastic tube that is used to contain the coins and that can be snapped closed. The tube allows for easy storage and makes the coin even easier to find. You can also buy the coin in a composite red box, containing 500 of them. The boxes are likewise designed for stacking and storing. Overall, the American eagle 1-ounce gold coin is a stunning coin that has stood out thanks not only to its easy size and practicality but also because of its excellent design that is very much iconic at this point. Invest in the American eagle 1-ounce gold coin to know precisely what you’re getting, to ensure you will easily be able to find plenty of buyers for your investment and to enjoy owning a coin that is a piece of American history.